Maury sent out survey ships to take depth readings in the Atlantic Ocean to begin building a map of the ocean floor. The data they gathered revealed a submarine mountain range in the middle of the ocean. Later researchers discovered that this ridge – the Mid-Atlantic Ridge – stretched the entire north-south length of the ocean. Maury made it standard practice for ships to carry logs on which sailors recorded scientific data he requested about the oceans. Voyages became safer after Maury initiated the use of internationally recognized sea lanes. However, for a time he also made the seas less safe, inventing the ‘electric torpedo,’ the single most devastating naval weapon of the American Civil War. Matthew Fontaine Maury was born on January 14, 1806 in Spotsylvania County, Virginia, USA. His father, Richard Maury, was a farmer. His mother was Diane Minor. Matthew was the seventh of the nine children she raised. The Maury family was quietly religious and gathered in their home for Bible readings morning and night. When Matthew was four, his family moved to a farm in Franklin, Tennessee, eighteen miles north of Nashville. They traveled on foot and on horseback, with wagons carrying their belongings; Matthew was one of the youngest children, and his sister Matilda regularly carried him on her back. Although he was eager to get an education, his father decided Matthew should work on the farm. At age 12, Matthew fell from a high tree badly injuring his back and almost biting his tongue off. His father, fearing Matthew would never recover enough for the hard physical work of farming, decided to allow him to attend high school. When Matthew was fit enough to ride a horse again, he rode six miles to Harpeth Academy twice a day, where he became one of the top students. Matthew’s older brother John had joined the Navy at age 13. By the age of 26, he was flag captain of the fleet and was destined for great things. However, at age 31, he died of yellow fever caught on a tropical voyage. He was buried at sea. Matthew was 18 when his brother died. Despite his brother’s death, and against his father’s wishes, Matthew was commissioned in the Navy as an acting midshipman in February 1825, age 19. His father refused to give him any money to help with expenses and would not wish him farewell. A neighbor loaned Matthew a horse for his journey to the east coast and he left home with $30 in his pocket – he had earned this tutoring younger students at Harpeth Academy. There was no naval academy in those days and Matthew Maury immediately went to sea on a man-of-war, learning midshipman skills on the job. 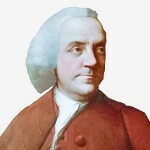 He worked hard on both practical and theoretical studies, chalking spherical trigonometry calculations on cannonballs. He was paid $19 a month and sent half of it home to help one of his sisters. A four-year voyage on the Vincennes took him around the world – he was in the first United States’ warship to circumnavigate the earth. In 1831, age 25, Maury was promoted to sailing master of the sloop-of-war Falmouth. For the first time in his career he had his own cabin. Maury’s ship was due to sail from New York to the Pacific Ocean via Rio de Janeiro. As sailing master, Maury was responsible for planning the ship’s route. In New York he sought information about the winds and currents the ship would encounter. He found nothing. He envisaged for the first time the creation of his famed Wind and Current Charts. 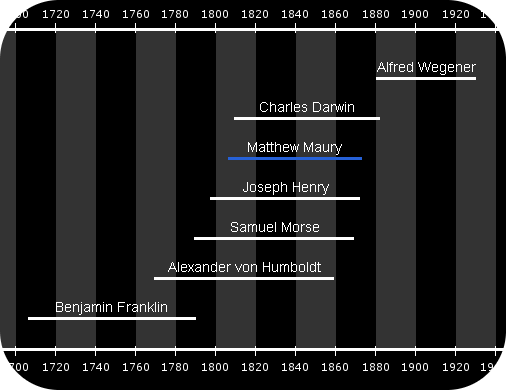 Matthew Maury’s lifetime and the lifetimes of related scientists. On the voyage to the Pacific, Maury’s ship Falmouth had to go round the infamous Cape Horn. Fascinated by the curiously low atmospheric pressures he recorded there, Maury later wrote his first scientific paper, On the Navigation of Cape Horn, published in the American Journal of Science in July 1834. Maury began working on a navigation textbook: A New Theoretical and Practical Treatise on Navigation, published in 1836. The book was well received, and in 1844 replaced American Practical Navigator as the standard U.S. Navy text for midshipmen. At the beginning of 1839, at age 33, Maury’s naval career came to a shattering end. After giving up his seat to a woman passenger, Maury was traveling on top of a stage coach. The driver lost control and the coach overturned. Maury’s right leg suffered multiple fractures. While he was recovering Maury, using false names, wrote a number of spiky newspaper articles pointing to shortcomings in the Navy’s training methods. In 1842, now land-based, Maury became superintendent of the Navy’s Depot of Charts and Instruments in Washington, D.C. There he launched a project to organize and study the thousands of ship’s logs stored at the depot to learn more about the oceans. From these, he aimed to produce detailed charts showing typical conditions and optimal navigation routes for naval ships at all times of the year. Maury began a systematic study of the seas. Ships began carrying logs he had designed. Sailors began recording data including longitude, latitude, atmospheric pressure, water current direction and speed, magnetic variation, and cloud cover. Logging such data by ships – military and civilian – became the norm, adding significantly to our knowledge of the oceans. In 1844, the Depot of Charts and Instruments became the Naval Observatory. Maury became its director. Maury compiled all the available ocean data into wind and current charts, which he published in 1847. 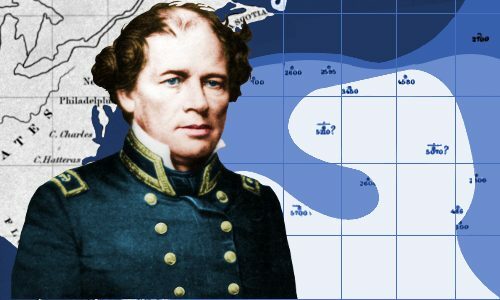 With his knowledge of winds and currents, Maury also accurately predicted where a ship last seen in trouble 300 miles off the coast of New Jersey would be found. Maury played a key role in the founding of modern oceanography. Other scientists were also active in the field. 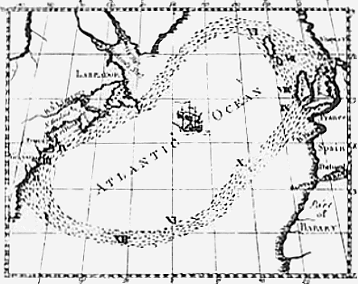 Decades before Maury was born, Benjamin Franklin correctly explained the Atlantic Ocean’s Gulf Stream after recording sea temperatures on several crossings. 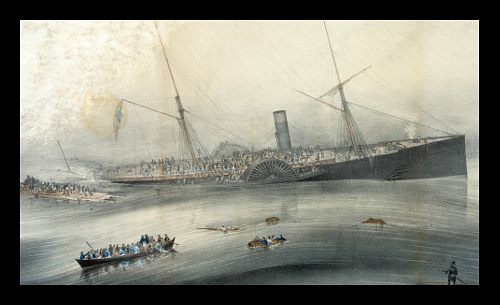 In 1854, 300 people died 50 miles off the coast of Newfoundland when the U.S. mail steamer S.S. Arctic went under after it collided with the S.S Vesta. In 1855, Maury proposed sea lanes in his book Sailing Directions, an idea taken up by the major shipping companies. The S.S. Arctic sinks. Image from lithograph by N. Currier. Maury used depth data collected by the U.S. and British Navies (the U.S. ships were following Maury’s instructions) to map depths in the North Atlantic. The data revealed to Maury a submarine mountain range on the ocean floor, which he name Dolphin Rise. Later researchers discovered that this ridge – the Mid-Atlantic Ridge – stretched the entire north-south length of the ocean. Maury’s 1854 work Bathymetrical Map of the North Atlantic Basin contained the first detailed mapping of the North Atlantic Ocean floor. 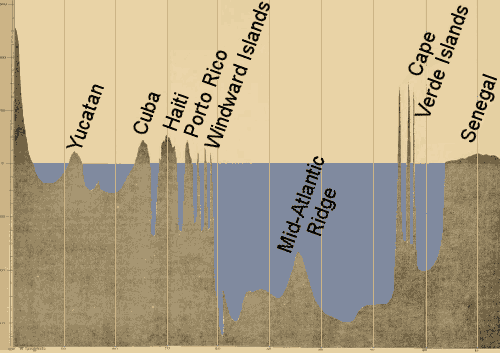 Maury’s vertical section of the North Atlantic from 1852 showing the Mid-Atlantic Ridge. Image enhanced and re-annoted by this website. Maury’s most famous work is The Physical Geography, a book published in 1855. The scientific consensus was that the book contained a great deal of valuable observations, but scientists were unhappy that Maury linked these to his own unusual theories. The book ran to multiple editions: it was very popular with the general public – Maury was a persuasive writer – and it sold in large numbers in America and Britain; translations were popular in France, Germany, Holland, and Italy. People who bought The Physical Geography were fascinated to learn such facts as microscopic sea shells had been found in samples taken from the ocean floor two miles under the Atlantic. When, in 1853, businessman Cyrus West Field became interested in laying a telegraph cable across the floor of the Atlantic, he consulted Maury to learn if this would be possible. Maury told him it was, and to go ahead. In 1861, the Civil War began and Maury, now age 55, resigned his naval commission: his home state of Virginia, part of the Confederacy, was at war with the Union states. He resigned with a heavy heart, because he did not want the United States to break in two. However, he did not support the legal abolition of slavery. Maury returned to the South, but spent much of the war overseas in the United Kingdom. Maury’s work for the Confederacy cost the Union more warships than any other factor. He designed what he called an electric torpedo – we would call it an electrically detonated mine. During General Grant’s siege of Richmond, Virginia, Maury’s mines prevented the Union Navy taking any part in the action. The War ended in 1865, after which Maury eventually became a lecturer at the Virginia Military Institute in Lexington, Virginia. In his lifetime, Maury received a large number of honorary degrees and awards including the Kosmos Medal of Humboldt, the Prussian Gold Medal of Science, and the Austrian Gold Medal of Science. Four U.S. Navy ships have been named for Maury: three named USS Maury and one USS Commodore Maury. Lake Maury, a reservoir in his home state of Virginia is named after him. In July 1834, age 28, Maury married his cousin Ann Hull Herndon, who was 22. They had four daughters: Diana, Mary, Eliza, and Lucy; and three sons: Richard, John, and Matthew. John was killed in the Civil War: his body was never recovered. Maury kept the lifelong simple Christian faith of his parents, reading psalms in the morning and praying every night. Matthew Maury died, age 67, on 1873 February 1, 1873 at the Military Institute, Lexington, Virginia. He was buried in Richmond, Virginia. "Matthew Maury." Famous Scientists. famousscientists.org. 28 Jul. 2018. Web.